Join us for soup, salad, cake and beverage and take home a lovely keepsake ceramic bowl hand-crafted by the Orchard Valley Ceramic Arts Guild! This year's event, which benefits CSA's Homeless Prevention Services Program, features two seatings - 3:00 to 4:30PM and 5:00 to 6:30. 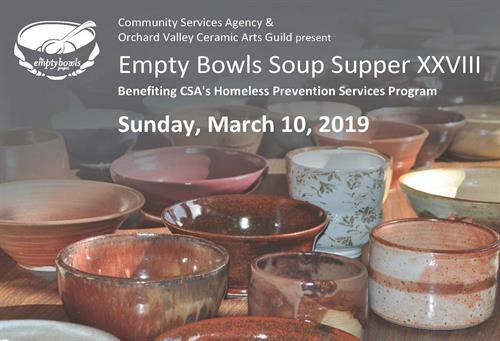 In addition to wonderful soups donated by local restaurants, Empty Bowls also features a pottery boutique and children's activities.